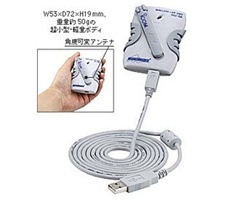 Can move smoothly on a laptop, one with USB connection for ultra-small wireless unit. Tiny enough to fit the body in the hand. USB PC to provide broadband wireless port. Notebook PC and comes with integrated Mauntinguhoruda can move. Provide built-in antenna and antenna diversity scheme in a variable angle. Strong security of transmitted data encryption AES, WEP features.